All of a Sudden: Things that Matter in Contemporary Art examines the paradigmatic shift in art practice since the mid 1990s. It is a book that art students must read and one their tutors must take on board or risk becoming further out of touch. It is also a book for curators to look deep into. This is a book for readers ‘who don’t really see Art as a game for smartasses and know-it-alls’. It aligns itself with the more speculative and provisional aesthetic witnessed in recent exhibitions like Unmonumental at the New Museum in New York and the most recent Berlin biennial. As co-editor of frieze, Heiser is an insider writing a daring book. The chapter entitled ‘Pathos versus Ridiculousness: Art with Slapstick’ is dynamite. ‘He is the Jacques Tati of Geometric Abstraction’—read it and find out who he is talking about. And if you like links between Ed Ruscha and Andy Kaufman, or Gordon Matta-Clark being compared to Harold Lloyd and Buster Keaton then you will adore the insouciance of it all. Underneath cute parenthesis and what initially seem flippant comments, there is genuinely insightful, pleasurable information. The chapter on painting starts off impudently declaring: ‘Let’s get one thing straight from the start: painting is not an anachronism; painting is relevant.’ This is the real deal and the most important part of the book. On Albert Oehlen he writes of ‘the art of painting as a punk gesture, doing away with false perfection by means of the right punchline.’ The brilliant passages on Daniel Richter—‘It was as if someone had locked a bunch of Abstract Expressionists in a studio and forced them to paint over each other’s marks on the same canvas.’ I’m pretty sure he likes Richter’s work and that is a compliment—it also evokes his style of painting. Similarly on Laura Owens—‘the amusingly pretty functions as conceptual camouflage for the ceaseless advancement of painterly intelligence’ is to me what the poet Keats called ‘negative capability’, an admiration for a kind of professional craft with plenty of room for the personal or informal. Enough of his compliments, his put down of Daniel Buren is a sort of no logo anti-corporate defiance: ‘Buren has long since become nothing more than a kind of art equivalent to the Adidas stripes.’ For a co-editor of an art magazine that carries so much advertising, his are brave new words, saying what others only secretly think but don’t dare utter. There is also a strong section on Glenn Brown in this chapter, in which he gives us the nugget that Ian Curtis hung his cat before he hung himself. I don’t believe this but, hey, even the great Paul Morley can’t quite inform, educate and entertain like this. Heiser’s taste in art is exquisite (to me anyway). All Tom Burr, Laura Owens, Wilhelm Sasnal and Franz West. His text is playful and rigorous and the illustrations are well chosen. 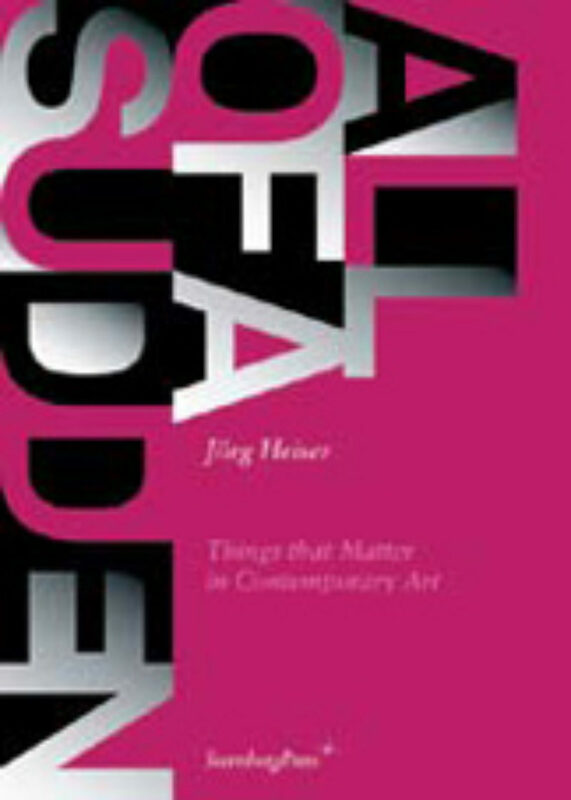 Finally a chapter on Art versus Market, in which Heiser takes us by the hand, choosing well with Seth Siegelaub as an anti-dealer and Santiago Sierra as an artist/manipulator of the market. By ending his book with Sierra and Tim Lee, Heiser’s one wrong move is that his only real discussion on not specifically western art, is right at the end of the book, almost as an after-thought. But this is a minor gripe about a major thesis. His daring composition is a must read for the still pure in a dirty business.